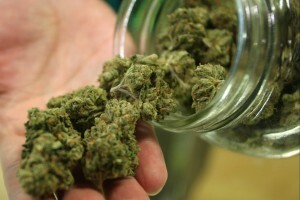 All around the country, marijuana is used by hundreds. Whether it be the legal use, illegal use, or for medicinal use, people will do whatever it takes to get their marijuana fix. For as long as I can remember, marijuana has been described as a gateway drug. I remember sitting in D.A.R.E (Drug Abuse Resistance Education) class as an elementary school student and listening to the teachers talk about how dangerous marijuana use can be when it comes to using other drugs. This would mean that when you start using marijuana you become more susceptible to trying other, new kinds of drugs. Although I am not a drug user, this topic is still very interesting to me. I wonder if there is any kind of link between smoking marijuana and using other drugs. I wonder if what the D.A.R.E. teachers had told me was actually backed by science all along. In order to break down this issue, scientists must first test the hypothesis that marijuana is indeed a gateway drug to other drug use. There is a correlation between marijuana and the use of other drugs. In their studies, scientists are trying to reject the null hypothesis which states that there is nothing going on except chance, meaning marijuana use would not lead to a further desire to try other drugs. They are also testing to see if there are any alternate hypotheses that come into play at all. An alternate hypothesis would state that something is definitely occurring, which would mean that there are facts that link marijuana and the desire to try other drugs. In a study found here, an observational trial was conducted which followed 1265 people throughout a period of 14-25 years and measured their frequency of drug use, then compared it to the number of other drugs that the people reported they used during the test period. The results that they uncovered were consistent with the hypothesis because frequent users of marijuana were more likely to use other illegal drugs. However, although this evidence supported the hypothesis, scientists were unable to find a clear mechanism to which the frequent use of marijuana caused the use of other drugs. Although this study was partially successful because it was able to find evidence which supported the alternate hypothesis, I feel that it could be improved. Scientists could take into consideration the third variables which could affect other drug use such as heavy alcohol consumption which is known to cause risky behavior. Also, instead of having people self-report drug use, I think it would be better to have them come in for monthly drug tests. This way, scientists can know for a fact which drugs people are and are not using. Although this method would be expensive, I think it is the only clear way to differentiate between what people say they are doing and what they are actually doing. Ethically speaking, an experimental trial, in this case, needs to be ruled out. Scientists can’t just go around letting people smoke weed and then measure what other kinds of drugs they use. This would not only affect the health of the participants, it would cause an issue with the law as well because many of these drugs being tested for are illegal. Although marijuana is popularly believed to be a gateway drug, scientists have actually been able to determine that the true gateway drug is alcohol through other studies. A study conducted a poll between 2835 12th grade students from around America to determine which was the first substance used which then led to trying other substances. Between alcohol, tobacco, and marijuana, results showed that alcohol is the most commonly used first substance prior to any other substance use. Scientists were also able to discover that the earlier kids began to drink alcohol, the more likely they would be willing to try other illegal substances. Although this is another self-reported study, based on these facts, alcohol is a more impactful gateway drug, not marijuana. This study can be easily improved by increasing the sample size. 2835 12th graders is a very small number compared to the 3.5 million expected to graduate between 2016-2017. With a larger sample size and more studies, it reduces the possibility of the results being due to chance. Just like the previous experiment, ethically, this would never work in an experimental trial. Scientists could never give alcohol to 12th graders and then track what other kinds of drugs they try. Not only is this morally wrong, it is also against the law. What we can take away from these studies is that although many believe that the true gateway drug is marijuana, correlational evidence actually shows that it is alcohol. These findings were able to accept the null hypothesis because the studies prove that although there is a link between marijuana use and use of other drugs, there is no true mechanism in order to prove this. Many cases have been solved where a solution is found before the mechanism like Andrew described with scurvy and lemons. Also, like the prayer study we went over in class, the null hypothesis either can be true or it can be a false positive. Scientist’s conclusion that alcohol is the true gateway drug rejects a popular belief that many people had cemented in their minds. Although these observations and findings are still correlational, I still believe them to be true because most people try drinking alcohol before anything else. If you are not trying to get into any other kinds of drugs, it is a good practice to stay away from alcohol at a young age as studies prove it can lead to further drug use. I guess the D.A.R.E officers weren’t entirely wrong when they said that marijuana is a gateway drug, but there is no true mechanism allowing this to be deemed true or correct. In my own opinion, I feel that if you can exhibit self-control, you shouldn’t have any kind of substance abuse issues. This entry was posted in Uncategorized on October 13, 2016 by Michael A Lupo. Great job! This blog was well-written and very interesting. I’ve always thought that the use of marijuana can cause someone to venture out and try more drugs in the future. 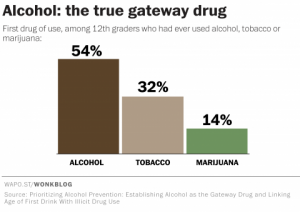 However, after reading your blog , I am very shocked to find out that alcohol is more of a gateway drug than marijuana. I’ve never thought of alcohol as a “drug” which is why it was so surprising to me. Being in college, especially, we should all be extremely careful of our alcohol use and where it can lead us. The more I’m thinking about it, the more it makes sense. The first “drug” adolescences try is alcohol. In the article, http://www.drugfree.org/resources/top-8-reasons-why-teens-try-alcohol-and-drugs/, it goes into further detail on why teens even try drugs in the first place. I also like how you tied in topics we’ve covered in class, like the healing of prayer! This is really detailed and well written, nice job. I have always believed that this question is a bit unnecessary, if not entirely. It is of course a very important topic that affects so many people, but aren’t all substances, in a way, gateways to something? Safe neighborhood advocates and aggressive moms will tell you marijuana is a gateway drug until their mouth falls off, but the nature of these opinions is neglected the second they get home to their alcohol. All drinks and spirits and drugs create something within humans, how can we accurately decide that one is more controlling and negative than another? The attack on marijuana is entirely due to the fact that alcohol is legal and weed is not. This is the only reason high school parent boards get loud about the issue. And on top of this, like you pointed out, alcohol is often a worse presence of substance abuse in lives that are shifted by addiction. I think the world needs to address marijuana and alcohol similarly, in that both have a similar threshold for effects and consequences, except that you can get poisoned and die from drinking.